Many jobs don't fit neatly into the standard purchasing categories of spring shop, machine shop, stamping house or component manufacturer. 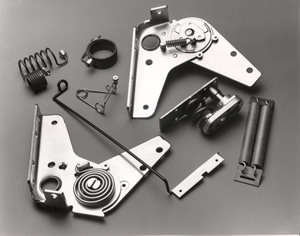 Spring Engineers is fully equipped to handle custom spring assemblies and sub-assemblies. We're not just about component parts. Let us assemble your custom springs and metal stampings. We specialize in the assembly odd job. Many of our custom springs are combinations of a variety of resources. We have custom springs that must be assembled to precision machined parts, added to electrical components, welded and pressure tested. Let us do a turn-key assembly or sub-assembly for you.